Powering your inflatable boat or kayak with a quiet stealthy electric trolling motor is EZ …and affordable! Cabin Fever has set in and questions are pouring in from snow-bound fishermen looking ahead to spring. The #1 question? What size trolling motor do I need for my new Sea Eagle Inflatable Boat? With motor-mounts now available for most of our kayaks and all of our fishing boats here are are some Tips I’d like to pass on. Tips learned over the last 15 years of motoring with Minn Kota power on the back of my Sea Eagle PaddleSki. Until recently the PaddleSki was the only kayak offering a motormount. Now all of our premium Sea Eagle kayaks offer motor-mounts so let’s take a l look at Green Friendly economical power choices for Sea Eagle inflatable kayaks and inflatable fishing boats. Electric trolling motors are chosen by thrust. Higher pounds of thrust WILL NOT move a boat faster. In fact two 55 pound thrust motors will not move you any faster than one 30 pound thrust motor. Higher thrust 12V trolling motors are designed for bigger heavier boats with larger payloads. The maximum speed of a trolling motor is 5 mph regardless of how many pounds of thrust. The 55# thrust MinnKota Endura with all the new electronic gadgetry is overkill. Save your money! Pick up a MinnKota 30# Endura at half the price of the larger thrust trolling motors. The twist-grip speed control on a MinnKota has 5 speeds forward. On the top of the MinnKota Endura motor are markings, actually a reference graph that show how many hours your boat will run at speeds 1 thru 5. If you ran it continuously at the highest speed (5 MPH) the battery would last two hours, Speed 4 – 4 hours, speed 3 – 8 hours, speed 2-12 hours, and the lowest speed 1 -16 hours. I find that by prudent use I can enjoy a weekend on the water between charges. Here’s what you need to get you going and keep you going. The items I’ve selected below have served me well for over ten years. Careful shoppers can locates these items for less, or you can save the hassle and leave it up to us.. Simply click Add to Cart and we’ll get these time proven 12v accessories coming your way. Taxes and Shipping Included. We don’t sell trolling motor batteries because of weight and safety concerns but we tried all of the storage battery solutions trying to increase range while decreasing weight and we still prefer the old fashioned 12V Class 24 Wet Cell RV/Marine Battery. These batteries are available everywhere and run from $75 to $260 and are the least expensive available. I buy my batteries at Costco and I stay away from the pretty $260 Optima Blue-Top marine batteries because I’m going to put my battery out of sight in a Battery Box so unless this Blue Top Optima at $260 buys me less weight (it doesn’t) and more range (it doesn’t) we’ll keep our costs below $100 and stick to a clunky 12v class 24 RV/Marine Deep Charge Battery. Try Costco, Walmart, or your favorite battery supply store and tell them you want a Class 24 marine Deep-Charge battery. Not a starting battery but a deep-charge battery. Starting Batteries look the same as Deep Charge Batteries but fully discharging and recharging a starting battery will ruin it in a very short time. I prefer a 10Amp Charger with automatic shutoff. Take a look at MinnKotta’s Marine Automatic three-stage 10amp charger. Retail $99 w Free Shipping. Battery boxes are a clean, easy and safe way to store and carry your battery to the boat. A no-frills battery box can be found for less than $20 or you might choose a Minn Kota Power Center. The Minn Kota Trolling Motor Power Center is ideal for small boats and transom applications on boats that do not have battery compartments. It features two manual-reset circuit breakers. Minn Kota electric motors are known to be the most reliable electric motors on the market. The Endura 30 brings you the reliability and performance you’ve come to expect from Minn Kota at a great value. While 30 lbs of thrust might not work for a heavy fiberglass boat, it is more than enough for our Motormount boats, Explorer, FastTrack & PaddleSki kayaks. This item is covered by 2 Year Minn Kota Factory Warranty, not the Sea Eagle two part guarantee. All sales for this item are final. Comments on What Size Trolling Motor Will I Need? I have a 11′ whitewater raft that weighs about 200 lbs with a frame that also weighs about the same. With a cooler and three adults, that’d make the estimated weight of the entire rig about 1,000 lbs. Would a 55 lb thrust trolling motor be sufficient in moving this raft upstream? Wouldn’t the downstream speed of whitewater rivers exceed the 3-5 mph max upstream speed of a trolling motor? i purchased one Newport Vessel 55lbs – which battery I should go for ? 12 V 100 ah or more than 100 ? Hi Sammy…Nice motor. With a motor that size I can only guess what you’re going to use it on. We sell light portable inflatable boats so our advice is to always go with the lightest battery available. A type 24, or class 24 12V RV/Marine battery is much lighter than a type 27. my guess is the 12V 100 AH is all you need. I’m seriously considering a couple of very light and very small sealed AGM 30AH batteries myself for my kayak’s trolling motor. Light weight trumps AH in my opinion. Bought a 55lb thrust newport vessels. Following your directions as far as battery, box, and charger. Do you have any recommendations on a circuit breaker (don’t mind paying for a good one) in case something were to happen? Cheers and thanks in advance for your time! We always use Minnesota motors but the following info is generic. Circuit breakers are not only great insurance for protecting your new motor, but they are also required by the Coast Guard for ungrounded current-carrying condutors. If a prop is caught on an underwater object (rock, log, thick weeds, etc) and prevented from rotating, the motor will respond by using more and more power from the battery in an attempt to turn the shaft. If this goes on for too long, the high level of current will permanently damage the motor, usually resulting in a completely totaled motor. A trolling motor circuit breaker is designed to “trip” at a certain amperage, which breaks the circuit and prevents the motor from overloading and damaging itself. At between $20 and $40, they are significantly cheaper than purchasing a brand new motor! Circuit breakers come in varying amperages, and you want one that has an amperage rating (or amperage trip point) that is just above the amperage draw of your motor at max speed. Both Minn Kota and MotorGuide make their own breakers that are rated to break at an amperage level above what their motors draw. As just about all Minn Kota motors pull less than 60 amps at full speed, the Minn Kota circuit breaker is rated at 60 amps. The reasoning is that if 60 amps is being drawn from the Minn Kota motor, it’s operating above the level it was designed for, and should be tripped. MotorGuide’s motors are mostly rated for 50 amp breakers. The exception are the MotorGuide Xi5 80 series, which require 60 amp circuit breakers. Do you have to get a brand-specific circuit breaker? Definitely not. As long as the breaker is rated for a level slightly above the maximum amperage rating for your motor your should be just fine. 1. Is this too much thrust for my boat? 2. What is the best shaft length for this 30″ or 36″? Why? 2. The shaft should be long enough to allow the propeller to extend 6″ below the surface and short enough to have the tiller at a comfortable reach. Well……. 30lb might be ok for a kayak with no wind or current, but I am here to tell you if you are using an inflatable boat (I.E.) non kayak and you have a head wind and current, 30lbs might not do the job. I have a SE9 with a Enduramax 55lb and I would not go any less where I fish. So the water you fish should be the deciding factor on the thrust of the trolling motor you buy. you are absolutely wrong tim. 30lb thrust means its pushing the boat at 30lbs of thrust, while a 55lb thrust motor would have 55lbs of pushing thrust on a boat’s transom! its simple math, even a 6yr old can understand that the higher thrust means better tracking in choppy waters. I would love to get a catalog sent to my husband 1131 alford st. Ridgecrest cs. 93555. Great info, just what I was looking for as I am doubting about my next move.. I am from Amsterdam and I fish in quite relaxed water, thus no current just some wind but quite flat water (never have chop here). My boat is a small fishing boat (fiberglass) which weighs about 300kg (660 Pound) when fully loaded with gear, battery, myself etc. I have been using so far a Minn Kota 32lbs which serves me well however it doesnt get me to the speed I need, I would say that the best I can get of it will be about 3mph. I am more than willing to invest in a 55lbs if I would know with absolute certainty that it will increase my speed on the water (even one additional mph will make me happy). Please please answer my questions, I am reading a lot of conflicting information and I could use a good advise. P.S drop me a line if you ever get to the Netherlands,we have some serious pike and walleye here and not to mention, massive carp! Hi Alan…thanks for asking. This is a great question and one we hear often.My calculations indicate that your boat, motor. battery, gear, and occupants as stated should move you along quite nicely on the waters you describe up to the 5 mph max that any trolling motor is capable of with a 30# trolling motor. Perhaps the shape of the boat creates more drag than a flat-bottom boat. It’s doubtful that a 55# would really increase your speed. Wipe it down and you will be good to go. What do ya think…… will this work? Hey Bob…looks like the perfect power package for your Intex. Hey Bob, how did that 30″ shaft work out for you? I’m curious because the motor Intex sells/recommends has a 36″ shaft. I’m going to purchase a Mariner 4 soon and if a 30″ shaft will work fine that can save me some money. Thanks in advance. Hello Captain, what can I do with an 18″ lbs motor, can I face a light river, or only use in lakes? You don’t mention what kind of boat the 18 pound thrust motor will be pushing but an 18# will move you up River in a mild current if the load is light enough. Does it fit if or is it sufficient If I buy a Minn Kota 30 lb. thrust for the Intex Excursion 5?? Im planning to do a Hardtop and 2 seat boxes on it? What kind of Battery do you recommend? H Amar…Thanks for your qustions and thanks for visiting Inflatable Boats 4 Less, our online Mom and Pop boat store. We don’t handle Intex but thr information on this blog entry regarding trolling motor size and battery size applies to all inflatables regardless of manufacturer. One more note on batteries. I’m considering buying the lighter and smaller 12V sealed batteries now available. The amp hours ratings are also lower meaning that it will run out of power sooner but I personally would rather carry two light weight batteries than one 50# 12V Marini Battery. My experience with the Intex Excursion 5 and a 30 lb motor is that the power is not enough if you have more than two folk on board, even against a mild current. If you intend only to carry fewer people, get a smaller boat. My reasoning for saying this is that I also have a 24v 86 lb trolling motor with which I have extensively tested on the Excursion 5. The Intex mount isn’t up to the job of delivering the power. You will need to add extension rods or use ratchet straps to further brace the Intex mount to the rowlocks in order to stop the heavier motor ‘tucking under’ the boat when you lay the power down. If you do get it braced properly, the Excursion goes well, but remains an unwieldy craft to control if too lightly loaded. Additionally, the longer shafts associated with the more powerful motors make for a very awkward control position, unless you again carry out modifications to provide yourself with a seat that raises you high enough above the transom to easily reach the control lever. I’d suggest my experiences show that a round transom inflatable simply can’t cope with a heavier engine than a 30 lb, and a 30lb thruster isn’t powerful enough for a 12″ inflatable with a load big enough to warrant the size of the boat. I also have a Watersnake 24 lb which only barely moved the boat in totally still water. I’m not knocking the Intex Excursion 5. It is a great family boat and the design means you can carry a lot of stuff and people in very shallow water, which is precisely what I use it for when I use it. We’re thinking about towing it behind a 2.8m solid transom Sevylor this summer, using the 86 lb motor to power the Sevylor and carry a couple of spare battery packs and all the gear in the Intex. Should be a laugh, which is what it is all about, if you ask me. I don’t think there’s one quick answer to your question. Most 64 widows wouldn’t be interested in boats or fishing let alone motors, batteries, and such. 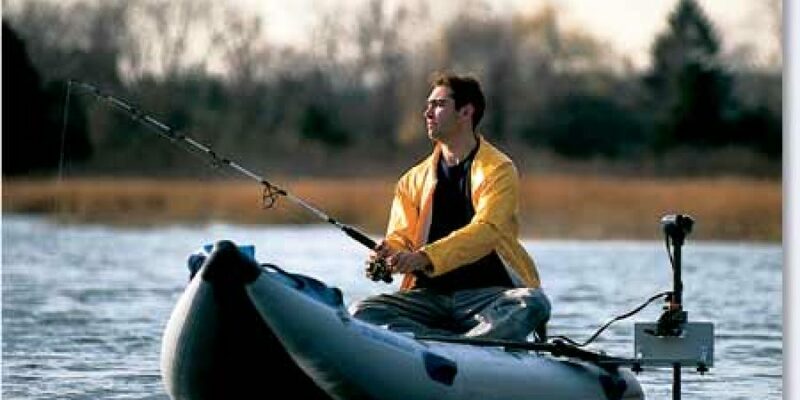 I would rule out kayak fishing and think abouta short but wide and stable inflatable boat. Laura..Thanks for your qustions and thanks for visiting Inflatable Boats 4 Less, our online Mom and Pop boat store. A hydrofoil is designed for gas powered outboard motors not electric trolling motors. Tomabala…Thank you so much! Look for website update and upgrades in 2018 and awesome coupon bargains to ease the higher in-season Sea Eagle prices. Also be looking as we make head to head or bow to bow comparisons between our price leader Sea Eagle 370 and 330 Sport Kayaks and the Intex K-2’s. It should be an exciting 2018 at IB4L! I have a 55 pound Traxxis, pushing an 18 foot canoe, loaded with gear for my loon work. My latest battery is a *sealed*, deep cycle battery, bought from a battery specialist. I learned the hard way, not to buy an unsealed battery and not to buy from any discount house and not from a sportsman’s outfitter either. Battery specialists are experts and their batteries have not been sitting on the shelf or in a warehouse long. If I get a couple of years out of it, it will be a strong 2 years and I will not have any holes in my clothing from tiny splashes of battery acid. As to the power of the motor, my 55 pounder is working a lot less than my 45 pound Traxxis did. At the same time, it has significantly more thrust (obviously), for changing directions or accelerating, and yes, it does have a little more speed, but the increased speed is not large. I will take the 55 pounder every time. By the way, I grew up in a mariner and have been on the water my entire life.